World Superbike champion Jonathan Rea received the Honorary Freedom of the Borough of Antrim and Newtownabbey on Tuesday. As a freeman of the Borough, Rea's special privileges permit him to herd sheep, which he duly did in Antrim! Rea is pictured at the Barbican Gate with Mayor Paul Michael. Four-time World Superbike champion Jonathan Rea MBE says he was ‘humbled’ to receive the Honorary Freedom of the Borough of Antrim and Newtownabbey on Tuesday. The prestigious accolade was bestowed on Rea at a public ceremony in the Theatre at The Mill in Newtownabbey. World Superbike champion Jonathan Rea pictured in Antrim on Tuesday. His name will now be added to the Council’s Roll of Honourable Freemen alongside other sporting heroes from the Borough including champion jockey Sir AP McCoy OBE and rugby legend Dr Willie John McBride CBE. Over 200 fans as well as family and friends joined with the elected members of Antrim and Newtownabbey Borough Council, Freemen of the Borough and other invited guests for the occasion. Rea, who equalled Carl Fogarty’s record of four World Superbike crowns in 2018, said: “To be made a Freeman of the Borough is a humbling experience and a significant honour for which I am extremely grateful and which I shall continue to treasure. The Freedom of the Borough is the highest award that the Council can grant and is normally awarded to local people and organisations who have, in the opinion of the Council, ‘rendered eminent services to the Borough’. Elected Members previously proposed and agreed the award in recognition of 31-year-old Rea’s outstanding services to sport. Mayor of Antrim and Newtownabbey, Councillor Paul Michael, who presided at the event, said: “Jonathan has well and truly put our country on the world stage and we are extremely proud to have him as one of Northern Ireland’s sporting ambassadors. 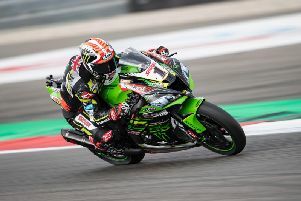 “As the first rider to win four successive World Superbike titles, he can lay claim to be one of the best two-wheel competitors across the globe. “We consider it a great privilege that Jonathan has returned back here to Northern Ireland and to our Borough to lay his family roots,” he added. As an acknowledgement to the Council, Jonathan presented the Mayor with one of his trophies, which he won at Lausitzring in Germany in 2017 after finishing in second place. Rea also asked that this perpetual award be presented at the Council’s biannual Sports Awards to recognise the excellent sporting achievement of an individual within the Borough. Following the official ceremony, Rea was interviewed by the BBC’s Stephen Watson on stage as he reflected on many of the highlights of his incredible career to date.